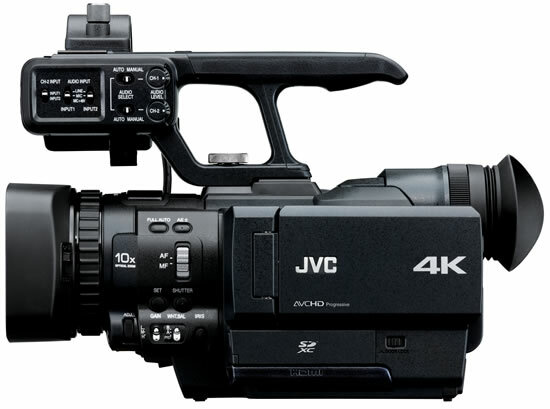 JVC today announced the GY-HMQ10, the world’s first handheld 4K camcorder, which captures, records, and plays video images at four times the resolution of high definition television. JVC’s exclusive Falconbrid LSI processing takes raw image data from the camera’s CMOS device and dematrixes (deBayers) it in real time. 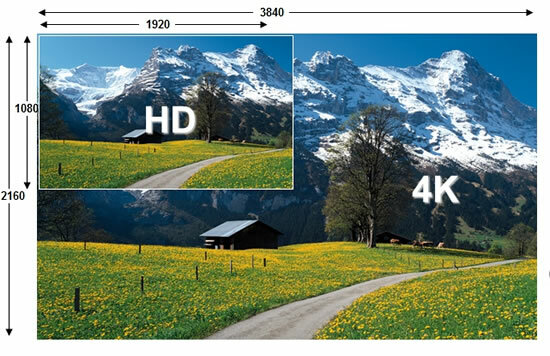 Unlike many high end 4K cameras, the GY-HMQ10 is able to output 4K images to a monitor or projection system in real time with virtually no latency. In addition to 4K imaging, the GY-HMQ10 also captures and records astonishing 1080i or 1080/60p full HD, with extraordinary detail provided by its 8.3 megapixel imager and superior lens. Similar in size to JVC’s popular GY-HM150 ProHD camcorder, the JVC GY-HMQ10 includes a build-in F2.8 10x zoom lens with optical image stabilizer, as well as a color viewfinder and 3.5-inch touch LCD monitor with a new, intuitive user interface. HD is recorded on a single memory card in a format compatible with most editing systems. Other features include JVC’s patented Focus Assist, as well as manual and auto control of focus, iris, gain, shutter, gamma, color matrix, and white balance. 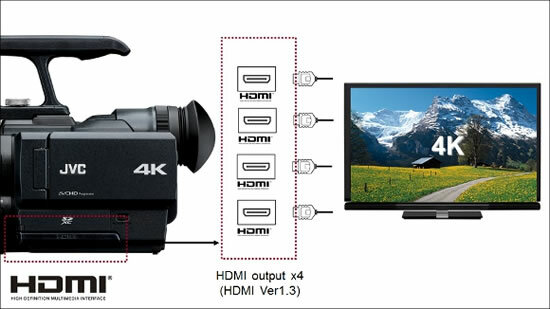 Plus, the camera has the unusual capability of live 4K output via four HDMI terminals. 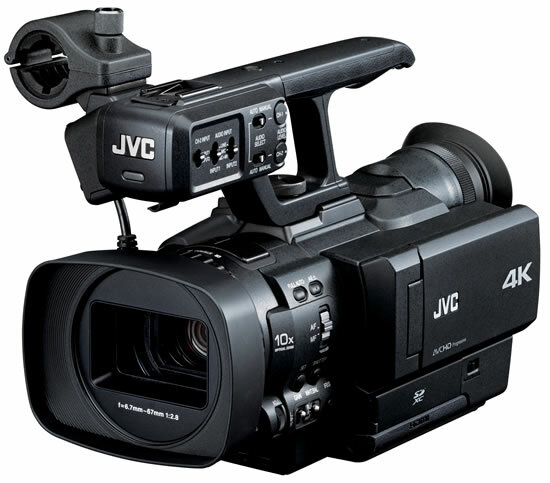 The JVC GY-HMQ10 is equipped with manual level controls for audio, with audio metering in the LCD and viewfinder displays. A microphone holder and two balanced XLR connectors with phantom power are located on the handle. The camera is equipped with a built-in stereo mic for ambient sound pickup. At a retail selling price of $4,995, the GY-HMQ10 launches today, with market deliveries beginning in March, 2012.